I'm marveling over every detail of your design... everything flows together to create a singularly magnificent jewel. Truly marvelous. The proportions are superb, and the side stones highlight the center stone brilliantly. It feels substantial yet delicate at the same time, magical! Thank you so much, Victor! It's simply perfection. I received my ring! It’s absolutely gorgeous!!!!!! I love it sooooo much!!!! I appreciate ur nice art work!! Victor and his team helped to make a jewelry dream of mine come true. 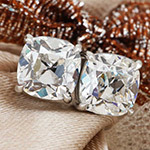 I have been looking for an alternative to diamond studs but with the sparkle and life of round diamonds. Victor found me a pair of diamonds in his cushion cut that are spectacular and had them set for me in time for our anniversary. The service, support, and quality were all first class. Thank you, Victor and team! Thank you, it was a pleasure working with you, and your work is incredible!! I have received the rings and absolutely love them! They are so gorgeous... thank you!!! Thank you for creating the most beautiful ring I have ever laid eyes on. It completely exceeded our expectations in every way. We've got a ton of compliments and how perfect the ring looks. I went to the most critic appraiser in new york (*D V*) over the weekend. She was beyond impressed. Said in her 30 years of appraising, she's never given an excellent grade for single cut melees. Thank you again for the beautiful work. I have no words. You have exceeded my expectations of what the ring would look like. You truly are a master of your craft. I could not thank you enough for making my idea come to life. I absolutely LOVE my new ring. It is beyond gorgeous!!!! As beautiful as the pictures are, they do not do this ring justice. My husband and I both said, “Oh My Gosh” at the same time when we opened the box. Haha. I can’t stop staring. I will definitely be back if we ever need anything else done and I’m sure my friends will all be asking where I got my ring. Haha. I just wanted to send you another thanks for your wonderful craftsmanship and professionalism. Making a purchase like this is a nerve wracking experience and you made it feel comfortable every step of the way. The ring came out better than we ever imagined. I just want to say thank you for a stunning setting and a band that matches it perfectly. Your craftsmanship is impeccable and beautiful. Stefan and I would like to thank you for making this BEAUTIFUL ring--both of us LOVE it! We also appreciate your patience and easy communication throughout the whole process. Purchasing a diamond ring online all the way from California while we are based in Midwest sounds pretty wild, even as I put it down in this email right now. We were simply amazed by how everything all worked out perfectly in the end! Please keep doing what you guys are doing, for all those who would like to celebrate their love. You definitely add the brightest color to our story! Spectacular isn’t the word. Wow. Thanks so much for turning this around so quickly. And the work is nothing short of amazing. I’m SWOONING hard! I’m elated at how she turned out! You know, sometimes with maco pics you don’t get the true sense of scale. She is so delicate and feminine and perfect! My stone is MUCH enhanced in this setting. I LOVE (sorry I’m shouting:) the cathedral shoulders. I adore the band and how the diamonds taper. I love the soft rounded shank. Love the teeny tiny milgraine! The basket takes my breath away every time I look at it, exquisite! And the prongs...they are divine! This ring is ME. Thank you, I’m honored to wear this piece of art. FINALLY I got to open the package last night and I was swept away! The diamonds are GORGEOUS and can even be seen in the dark! The sparkle in the sun this AM took my breath away!! THANK YOU for such a beautiful ring! I have admired this setting for sooooo long and never imagined I might even get it one day. Your workmanship is extraordinary and looks wonderful upon my finger! Thank you! What can I say about the quality and beauty of Victor Canera's work that hasn't already been said so many times in prior reviews? That Victor's pieces are stunningly beautiful? Yes. That the quality of his workmanship is impeccable? Without question. That Victor is a very nice and approachable guy? That too. Prior to having Victor make my ring, we did our homework and read all the reviews. We quickly found everything we read to be true...and more. 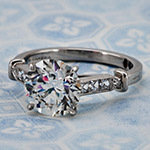 The beauty of the ring Victor made me truly took my breath away. That said, after going through the process ourselves and seeing the end result, I can tell you what doesn't really translate through all of the superlatives and photos is the incredible quality of Victor's pieces. This will not resonate with anyone reading these reviews until you actually hold a piece in your hand or put it on your finger. I couldn't believe how delicate my ring looks yet at the same time feels so durable. The piece looks and feels so expensive. Even the back of the ring, which is not pavé'd with diamonds feels luxe! This is all down to Victor hand forging each and every piece. While most other custom jewelers use a technique called wax casting, which is significantly less expensive and a much simpler manufacture technique; Victor, through hand forging, takes a piece of metal and hammers, chisels, shapes and hand assembles all his pieces. The end result is simply incomparable. All of that said, it wouldn't matter how great his pieces are if Victor wasn't the kind of person he is. 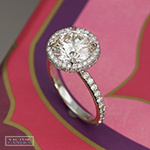 Victor is known for doing amazing halo and vintage style rings for what I like to call door-knocker size center stones. My stone is definitely not in the door-knocker category, yet he gave us the same attention and consideration that I have no doubt he does for his clients with larger budgets. 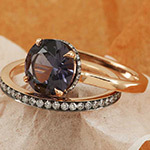 I wanted an Emilya ring with bezel setting, but with a different type of bezel. I had a bit of hard time describing what I was looking for and we exchanged multiple emails to ensure we were on the same page. Each time we exchanged emails I gave him an easy out by telling him if it was too much trouble, or if he wasn't comfortable with the design, or didn't think it was possible, that it would be fine to set the stone with prongs instead. He would have none of it. He kept emailing until he was satisfied he understood what I wanted. Needless to say, he nailed it! Thank you, Victor. I have never owned anything so beautiful. I can't stop staring at my ring, nor can anyone else! Victor is the Picasso of Platinum! The Maestro of Metallurgy! He is a talented artist with keen ability to disguise the appearance of a setting’s prongs so they blend seamlessly into the diamond. It’s like my solitaire is levitating above my finger. Well done, Mr. Canera, well done! I received the ring, and it is beautiful! Thanks to... Victor for a job well done. I'm sure my soon-to-be fiancee will love it. the ring arrived just in time - it's incredible ... absolutely delighted! Victor Canera is truly an artist and has a gift for minimizing the appearance of metal so all you see is diamond!! He set my 3+ carat round stone in his Classic Solitaire with Double Wire Prongs and I could not be happier. Everywhere else I looked the settings I saw had chunky ugly prongs holding the stone in place. Victor was able to create a dainty yet extremely durable ring for me and he set the stone with such precision, the prongs actually blend into the facets of the diamond. When people look at my ring they are always turning my hand to see the setting because they can't figure out how the diamond is just "hovering" above the band. I got my ring this morning after a very sleepless night. I just wanted to tell you how grateful I am and how much I love it. It was a very scary experience buying a diamond AND setting sight unseen, and I was so nervous about EVERYTHING (Will it be yellow?? Will I see that inclusion in person?! What do I tell Scott if I hate the ring I picked out myself?!?). At first, I couldn’t bring myself to open the box...until I just decided to get it over with, and then I squealed! The diamond is amazing and the setting is exquisite; it really is a marvel. Thanks victor. she said yes!! it's been a pleasure working with you. Great experience, wonderful to work with, not pushy at all. Ring is beautiful, workmanship is superb. Could not be happier! I absolutely love the double edge Emilya Victor created for me. Victor's work is impeccable. I highly recommend Victor if you want a beautiful, hand forged, show stopping, well-made ring! Victor will give you his honest opinion when discussing ring ideas; which I really appreciated... Victor's flawless work is worth every $ spent. 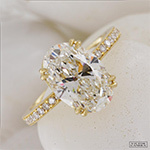 I first encountered victorcanera.com in my search for a rare, ideal antique cut cushion diamond. Victor had many of his signature antique cushions already in stock including a few that matched my criteria. There were photos and even a video that showed how brilliant this diamond was. It was quite fortuitous that I decided to purchase a diamond from victor because as it turns out, he also happens to be a master at designing and creating hand forged jewelry, a process that is not to be underestimated. I was expecting to purchase the diamond and take it somewhere else to be set in a custom setting but after reading all the excellent reviews about Victor online, I decided to work with him on a setting. I told him roughly what I was looking for, and provided him with a few photos of examples of what I was looking for. He then provided me with some additional photos of other settings to highlight certain design aspects that he suggested. We pieced together a concept and eventually agreed upon a design. He was incredibly patient with me during the planning process and educated me on some of the finer points in his jewelry making process. I was admittedly a little hesitant to place an order for a ring that I had not ever seen but in the end, he delivered an incredible work! 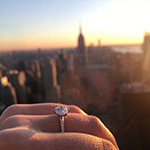 In person, the ring is even more stunning than any photo or video could ever do justice! He is an absolute artist and a master craftsman, perhaps the only person you will find that makes his jewelry completely hand-forged. My fiancee now has a ring that she loves and has been highly admired by many. Thank you Victor! There is my beautiful pendant. I can't wait to wear this everyday, thank you Mr. Canera! This piece truly means the world to me and will be cherished for the rest of my lifetime. 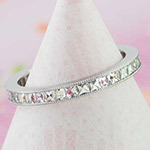 We'd also like to add that the Canera European Round diamond is gorgeous!! 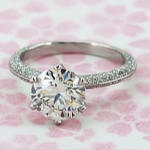 When we first started looking at rings, Chris liked the timeless and classic look of a round diamond. There was something about rounds that never appealed to me as much a cushion cut. As soon as I saw your European round, I knew that was it. 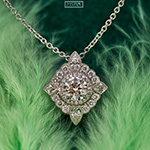 The beautiful facets and the floral pattern appealed to me more than other round diamonds I had seen. 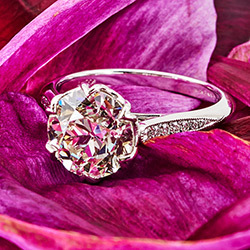 The round diamond in the cushion halo is absolute perfection! Thank you again! If you want high quality work, beautiful design, amazing customer service, you have to go to Victor. He did a wonderful job on my engagement ring, listened to all of our requests, provided us honest feedback, and gave us a 5-star customer service! 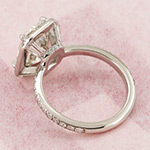 I would recommend Victor not just for the perfect engagement ring, but any other jewelry pieces. I have seen some of his other work in person and they are amazing! Our initial communications were prompt but thorough. Victor and I had never met face to face, as I live in London, but he still gave me the time via phone & email to as if I were a shop customer. He paid great attention to the kind of ideas my fiancee-to-be liked in a ring, and then put his own design forward. The end result is a breath taking work of art. Truly a cut above rings I've seen around. I am see myself coming back for wedding bands pretty soon. Thank you for your excellent job. It was a pleasure to work with Victor in designing an engagement ring for my fiancee. Victor is a true master at his craft. The ring which Victor created is absolutely beautiful. The detail and precision are incredible. I was amazed by how fine and delicate the milligraining of the ring is. It's incredible to think that Victor creates all of the pieces for the ring by hand. The design and proportions of the ring are gorgeous. Victor creates works of art which are not only of amazing beauty, but also of excellent quality. Friends and family who have seen the ring have been amazed by the ring. Recently, while in a jewellery store, a sales person asked if my fiancee's ring had been custom made. She said "I could tell because they don't make rings like that anymore", referring to the ring's excellent craftsmanship and beauty. To anyone who is reading these reviews, wondering if Victor is the right jeweller to choose, I can whole heartily recommend Victor Canera. You won't be disappointed. Thank you @victorcanera for creating SUCH a beautiful ring for me! Pictures do not do the ring justice! The quality in craftsmanship is top notch. I've never seen a diamond sparkle so much in all different types of lighting! The cut is IMPECCABLE. The process was so easy! I get compliments daily! Thank you thank you thank you!! It is not often that I have encountered such great service. The timeliness of replies, generosity of Victor's time while visiting his office, patience in answering our many questions, true passion for artistry in his creations, timeliness of delivery of the final product -- everything was perfect and we could not have asked for anything more. The Victor Canera Hearts and Arrows cut is perfect and its fire, scintillation and overall brilliance are amazing. His efforts to source raw stones and have them cut to his own exact specifications is truly amazing. Our Emilya ring is more beautiful than we imagined and we sincerely appreciate the time, effort and energy Victor put into creating this work of art for us. The delicate halo, the tightness of the fit just under the girdle of the stone, the perfect pave and excellent polish all contribute to this masterpiece. His custom platinum work is truly amazing. Victor achieved the perfect balance of presence and lightness, an elegant delicateness that transcends today's mass produced molded world and is better suited to an era of the past when art mattered. Even though, I'm based in the UK many, many miles away from Victor Canera, he is now officially my go-to jeweller. He has created some beautiful pieces for me... I have also fully trusted him to obtain the stones for my designs as well. He is incredibly patient, allowing me time to make decisions and offering good advice to meet with my design likes but within my budget. Excellent quality designs to meet excellent customer service. Highly recommended. Most importantly we trust him and his products and that goes a long way in this business. When the ring finally came in the mail I could not have been any happier. Victor's work is so good, it doesn't even feel like I'm wearing an eternity band. The diamonds used are so sparkly. They are a glittery row of diamonds on my finger. It's my dream ring. I would highly recommend Victor Canera to anyone who asks! I was looking for something specific in an engagement ring: a gorgeous diamond, with a sleek, beautiful, and slightly lower setting. One look at Victor's website (please do) and you will see how amazing his work is. I originally saw his work on pricescope.com and was so impressed with his work in "real life." 1. The absolute quality of the work. I have shown the ring to people (no proposal yet) and everyone is absolutely amazed. 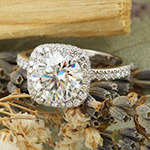 The ring is delicate and showcases the diamond perfectly. It is a really beautiful marriage. 2. How great Victor is to work with. I got very specific -- started with Victor's gorgeous Trueste as the base and wanted modifications from there. The person the ring is for was very adamant about two things: the flow of the cathedral setting and that the diamond be set lower to be less intrusive. Victor listened and made sure he understood what we were looking for. He also was good about letting us know when something might not work with the design. I told him to use his judgment in those areas and the ring is better for it. 3. 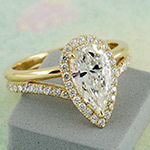 His diamonds are lovely... Victor has a line of Hearts and Arrows diamonds himself that are absolutely stunning. The light performance on the diamond is excellent. I could not be happier. In fact, we have bands to make and a 70th birthday present for my mother. I will definitely be using Victor for all these things. Thank you, again. I worked with Victor to pick out a center diamond and engagement ring after coming across his name for customized jewelry. While I had some general knowledge about rings from my own research, Victor was able to guide me through the process and pick out a stone to go with the setting I had selected. He was very professional and answered all of my numerous questions. My fiancee loved her engagement ring so much that I am going with Victor again to get a wedding band to match. I would recommend him to anyone who would like a personal touch and fine craftsmanship for jewelry. 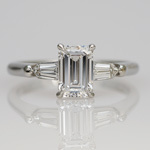 I have recently had the pleasure of working with Victor to create the perfect engagement ring. 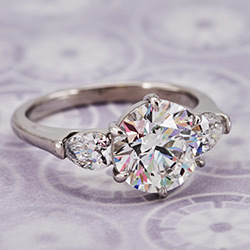 I was initially quite weary with purchasing a diamond and ring of this caliber over the internet even after doing a significant amount of research. In the end it was all worth it. Victor was easy to work with and he reassured along the way that I was purchasing a product that is hand crafted with a cushion diamond that is not easily found anywhere else. He is a true professional and master craftsmen and his work reflects this in spades. 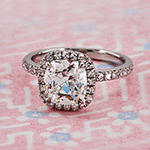 I opted for a cushion cut diamond set in a halo setting which, in my opinion, Victor has perfected. Upon receiving the completed ring I was astonished! My fiancé was speechless and she has not been able to stop herself from just sitting there and staring at it. We could not be happier with Victor's work and we have even gone into some of the more premier jewelers in our city and have yet to come across a ring that comes close to Victor's in workmanship and quality. We remain stunned!!!! LOVE LOVE LOVE !! I was worried spending so much money especially when I am from Australia but I am super happy that I did ! Saw amazing reviews of Victors Pave work... Did my research and took that leap. I end up purchasing one of his amazing Heart & Arrows round diamond to be set in Emilya Halo Solitaire with matching Pave Eternity Band (with our birth stone inside). All the proportion are to perfection. Elegant, Delicate with minimal metal as how I wanted. Quality is amazing and the diamond sparkles like crazy. Victor himself is amazing to deal with. Communication was on point and he goes above and beyond to make sure that we were happy and that the process was stress free. It was lovely to fly all the way to LA to meet you. Highly recommend !! No other jeweller will beat Victor Canera workmanship. Victor is from a family of jewelers, and it shows. The ring he made is truly one of a kind. 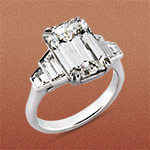 The diamond's unique shape combines the rounded edges of a cushion cut, with the rectangular shape of an emerald cut. As for the diamond pave around the gem and the band, it's ultra-thin and incredibly elegant--no wonder it's his specialty. And to top it all off, it was a great experience to work with him. He was very responsive and it was obvious that he takes pride in his work and wanted to make sure the ring not only came out well, but it made us happy!! I recently purchased an engagement ring from Victor and my wife and I couldn't be happier. He was able to use the center stone from my wife's original ring and built a dream setting that perfectly mirrors what she had asked for. He is very talented and for the quality of his work, his prices are reasonable. For such a major purchase, both financially and emotionally, Victor helped us through the process with patience and professionalism. Victor's work is simply amazing! It was a leap of faith for me to decide to work with Victor to create an engagement ring since my fiancee and I live 1600 miles away and it was not practical to go to his store in person. But it was important to us to have an extremely high quality, beautiful, hand-forged jewel. I researched other artists exhaustively and Victor's name kept coming up, over and over, with clients raving about the beauty and quality of his work. Victor made a variant of his Emilya halo ring for us, using one of his Canera Ideal Hearts & Arrows diamonds that we selected. The process of working with Victor and his team was incredibly easy and the results were amazing. My fiancee is thrilled with the ring and she regularly receives comments from complete strangers, telling her it is the most beautiful ring they have ever seen. We could not be more happy and have since asked Victor to create our wedding rings as well as a set of diamond earrings--those were also beautiful and exactly what we wanted. Thank you Victor!! I set out to reset my engagement ring and after many months of reading reviews and trying on rings I finally decided to move forward with Victor. It was the best decision I ever made because the ring turned out absolutely beautiful. The craftsmanship is just perfect and doesn't compare to what I tried on in dozens of stores. Not only is the ring beautiful but the service from start to finish was stellar. Victor was extremely pleasant and provided me with his thoughts to help me determine the right setting for my stone. I will love this ring for a very long time. Victor made my fiance's engagement ring and it is perfect. Pictures do not do the ring justice. The intricate detail and craftsmanship of the ring is superb, and you can definitely see the difference between his rings versus other rings sold at other jewelry stores. The ring sparkles like crazy and she always gets compliments from strangers. I highly recommend him. You will not be disappointed! Two things set Victor Canera apart: the quality of his work and his impeccable customer service. He deftly walked me through the most important purchase of my life and provided me with sound guidance on procuring the perfect engagement ring. 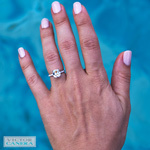 If you have one choice to pick your engagement ring jeweler, Victor Canera is it! I cannot recommend Victor Canera highly enough. He is a true craftsman with an amazing eye for proportions and detail. I have used Victor to make 5 items of jewellery over the past 3 years so I can speak from experience. I also live in Australia so have communicated via email for all of these projects. His communication via email have been so prompt and clear making the process smooth, stress free and exciting to see the finished piece. I especially like the high quality photos and videos of the finished products. His jewellery pieces are a work of art, so much so that I would only ever use Victor. Can't wait for the next project. Bought an Emilya halo engagement ring and sent him the diamond. He did an unbelievable job. One of the most beautiful rings I've ever seen. When I began my search for a perfect engagement ring there was one name that kept coming up, Victor Canera. Everyone spoke so highly of Victor's craftsmanship and experience that I had to contact him. I must say they were all correct. Victor couldn't have been a nicer person to work with and made the experience quite easy and carefree. The careful and deliberate manner with which he spoke to me greatly eased my concerns and his attention to detail was evident from the first moment I spoke to him. When I finally received the ring I was blown away. It was simply stunning, gorgeous and exceedingly sophisticated. It was flawless and my now fiancee and all who see it are enthralled by it. A Victor Canera jewel is timeless and his hand forged style is peerless. Thank you Victor! I have had the pleasure to work with Victor on two projects. I first purchased an Evelyn with Flush Stems setting for my Round Brilliant Diamond when I wanted to reset my engagement ring. The process was easy and Victor was a pleasure to deal with. I asked a number of questions as I attempted to make the best choice between the three different Evelyn settings and Victor was able to help me make the best choice for my diamond and lifestyle. My ring was completed on time, and exact match to the pictures on the website. I'm was very pleased with the results. My second project was to reset my 2 ct. Emerald Cut Diamond. The original setting created by another vendor was not visually appealing to me and the ring seemed to be top heavy tilting back and forth on my finger. I had a number of exchanges with Victor both on the phone and via email where he was very patient to explain the difference in two very similar settings. My new ring was completed on time and is perfect. The new Trilogy Setting sits nicely on my finger, doesn't spin and more importantly doesn't tip back and forth. The new setting allows the diamond to stand out more and actually appears to be larger than it appeared in the original setting. It is a classic design where the smallest details made a tremendous difference. I'm pleased to say my settings show an incredible level of detail and craftsmanship and I'm more than proud to wear two lovely works of art created by Victor. I can't wait for an opportunity work with him again. Bottom line: If you want a custom platinum ring, especially one with pave, this is your guy. If you want a halo....ppffff, don't even look elsewhere, go to Victor. After going to every jeweler in northern California we just couldn't find that ring that made us go WOW. Don't get me wrong, we have a ton of jewelers up here and there is a decent selection but for us, never got that OMG have to have it feeling. Then we saw some of Victors work, and that is where the searching stopped. A 5 hour road trip later we are talking to victor about what we want. It was weird, because there was no pressure at all. He is so laid back, listened to exactly what we envisioned, and gave his input along the way. The real difference with a Victor Canera halo is the delicacy (not to be confused with fragility, it has been a year and still looks new). Petite yet strong, elegant, and man, the craftsmanship really stands out. On a scale from 1 to 10, Victor turned that **** to 11. We couldn't be happier with our decision. Working with Victor was effortless and enjoyable, and the end result is a ring with impeccable detail that's extraordinarily well made. What makes Victor Canera's work stand out is that he is an artist so every piece is created uniquely... For this type of craftsmanship, its amazing what he is able to do – the fluid lines and curves that come together, the melee carefully paved into the platinum surface; metals and diamonds mixing perfectly to create a balanced, dainty yet sturdy ring. A big shout out to Victor for making me the MOST beautiful ring a girl could wish for! This is the stuff dreams are made of!!!! Great customer service, impeccable craftsmanship- I'm thrilled! We felt VC was the clear choice to create the setting. His work is impeccable. I love how little metal covers the pears - he gets the proportions just right! VC provided a gorgeous diamond (Canera super ideal Hearts and Arrows) that fit the specs we wanted. Ordering directly from him made the process less stressful and got us a discount on the setting. We have no regrets. I spoke to Victor on the phone once or twice and exchanged many emails with him. He and Paige answered all my questions in a timely and professional manner. I just proposed last weekend with a ring designed by Victor Canera. Working with Victor and his staff was about as easy of a process as I could have hoped for. Months before he began working on the ring he provided me an estimate and timeline for completion. When the ring was complete he stuck to his quote and had the ring completed well within the time I needed. My fiance and everyone who has seen the ring is floored with how beautiful it turned out and we cannot wait to have Victor work on our wedding bands. We got the ring a while back but my fiancé waited a while for the perfect moment to propose! It happened just yesterday and today I received endless compliments about how gorgeous the diamond is and how beautifully the ring was crafted. Thank you guys so much for helping us through this experience!!! It came out perfect. It's such a pleasure working with Victor! He is very talented: his designs are true classics and his craftsmanship is top notch. Victor created 3 beautiful and coveted rings for me. Also, he is always very kind and patient and offers great customer service. But most of all he seems to read my mind when it comes to design details. Since I am an overseas buyer, trust is very important to me. So, it helps that I can leave it up to Victor as I completely trust his aestethic eye. Victor Canera’s attention to detail and workmanship is absolutely second to none. He is one of the few jewelers left that hand crafts rings from scratch using old world forging techniques. My wife’s engagement ring turned out absolutely beautiful and she is constantly receiving compliments on it. I have since gone back to have both of our wedding bands and earrings hand made by Victor. We couldn’t be happier with his work! I have commissioned several jewelry projects with Victor Canera over the years. The craftsmanship on each piece he has created for me is truly amazing. His attention to detail is second to none while his customer service is top notch, too. I highly recommend Victor Canera to anyone looking for an exquisite, hand-forged jewelry piece that will last the test of time! I had the pleasure of having Victor Canera make me a pair of beautiful sapphire earrings with pave diamond halos in platinum. Working with Victor was easy because he is a master at what he does! I can honestly say after seeing his work compared to some of the major high end jewelers in the US, I believe his work to be equal or better quality. I look forward to working with Victor again, and he has my unqualified recommendation for making hand-forged heirloom jewelry. Victor made my engagement ring last Spring and we could not be happier with his work-- it is truly exquisite. We had looked at other jewelry stores in NYC where we live and there is no one we trust more than Victor. His eye for proportion and talent are undeniable. He was a pleasure to work with throughout the design process-- professional and patient. We are so excited to be working with him again on our wedding bands and cannot wait to see the end results, which we know will be elegant, heirloom, works of art! I own a number of Victor's rings and all I can say is AMAZING. I have taken them into many high end jewellery stores and the staff always oooh and aaah over them. Several well respected jewellers and valuers in Australia have mentioned not only are they blown away by each piece, they have the highest standard and quality of workmanship they have ever seen. I also enjoy working with Victor, he is a lovely genuine guy, always honest and helpful with an amazing eye to detail for a super fussy client like me. I can't wait to open the box containing the next Victor Canera piece - I am sure it will be another beautiful heirloom quality wearable work of art. After weeks of research on PriceScope, I chose Victor Canera to make my engagement ring and could not be happier with my decision. Victor is a true professional and him and his staff are easy to approach and communicate with. The skill and craftsmanship is well worth the price and the ring I received is better than I could have ever imagined. I proposed two days ago and since then my fiancee has received comments from strangers about her amazing ring almost every time someone has seen it! Would highly recommend Victor Canera to anyone! I recently went to go see Victor with my sister and even I couldn't be happier with the results. He definitely takes pride in his work and it shows. We were able to view his other work while we were there and I was amazed by what I saw. He took the time to educate us on the selection and made sure that we understood our diamonds and gems and didn't even seem the slightest bit frustrated or annoyed at all our questions. I may not have been taking in my own diamond but the work he did with my sisters diamond was exceptional. When its my time to choose my own I know that Victor is directly where I am going. He is top of the class and is shows. Thanks Victor! I just wanted to thank you very much for everything that you have done for us from start to finish. I’ve done a lot of research online and received many quotes from various jewelers in our attempt to find the perfect engagement / wedding ring combo. Your knowledge and expertise in this industry really made me feel comfortable and confident in my purchase with such detail and personal preference. Even 3 years later I still receive the same type of treatment and service as if I was a new customer. You definitely pay for what you get and “quality” is not just in the stone and product, but also in your great service. My wife is still in love with your ring as the first day I proposed to her.